The Reporter provides news and advertising information to residents in the greater Vacaville area of Solano County. The Daily Democrat provides news and advertising information to residents in Yolo County. The Times-Herald provides news and advertising information to residents in the greater Vallejo area of Solano County. The Enterprise-Record provides news and advertising information to residents in the Butte County area. The Oroville Mercury-Register provides news and advertising information to residents in the Butte County area. The Monterey Herald provides news and advertising information to residents in Monterey County. The Santa Cruz Sentinel provides news and advertising information to residents in Santa Cruz County. The Red Bluff Daily News provides news and advertising information to residents in Tehama County. The Ukiah Daily Journal provides news and advertising information to residents in Lake Mendocino County. The Lake County Record-Bee provides news and advertising information to residents in Lake County. The Times-Standard provides news and advertising information to residents in Humboldt County. 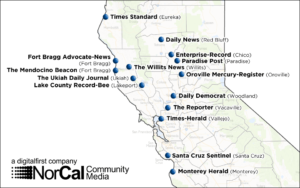 The Advocate-News provides news and advertising information to residents in Mendocino County. 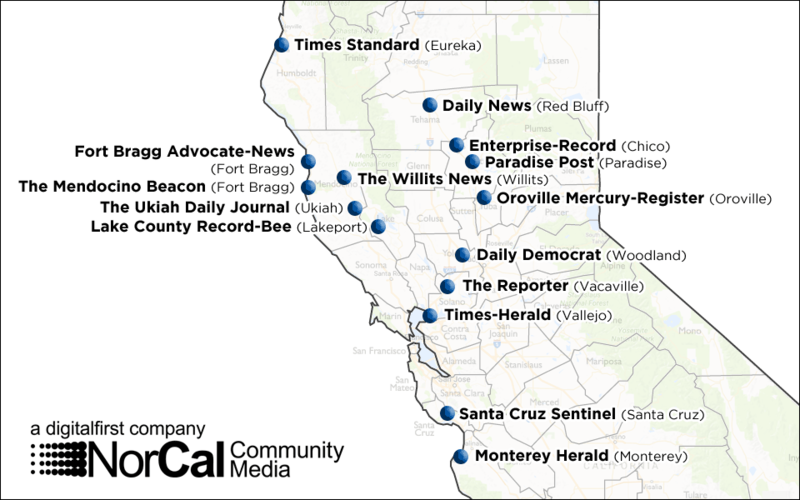 The Mendocino Beacon provides news and advertising information to residents in Mendocino County. The Willits News provides news and advertising information to residents in Mendocino County. The Paradise Post provides news and advertising information to residents in Butte County. The Redwood Times covers Southern Humboldt County including the communities of Garberville and Redway.